The sky is blue, water is wet, and the digital world is oriented landscape. But almost 30 years ago, that last truth wasn't exactly self-evident. Back then, Apple and others were experimenting with vertically-oriented computers. And it made more sense than you might think. Back in the 1990s I worked at IDEO and saved an early Mac foam model the office had had on display but was going to throw away. It was created in about 1989 by the nascent Apple Industrial Design Group and Matrix Product Design (which became IDEO). Foam models were intended as 3D sketches and were meant to be disposable. I'm not sure that many survive. We've looked at the zany Apple concepts that never came to pass before—including a vertical monitor—but this is more evidence that Apple was fairly serious about the idea. Was our world almost portrait-oriented? In the early days of computing, it seemed possible. After all, with early personal computing's emphasis on desktop publishing, it was only logical that the digital interface should mimic the physical medium it was replacing: The printed document. For example, one of the very earliest personal computers, the Xerox Alto, had a portrait display. The trend threaded its way through Apple, too, for whom a company called Radius produced a vertically-oriented display called the Radius Full Page Display, available for the Macintosh Plus as well as the Mac II. The same year, Apple introduced the Macintosh IIcx, the first case that could be oriented either horizontally or vertically thanks to its long, striated slats that could anchor a monitor on either side. According to Ed Tracy's excellent History of Computer Design, the idea for a vertical tower came from Apple CEO John Sculley, who came up with the idea to save more desk space. Vertical towers did end up becoming the norm. So what happened to vertical monitors? The foam prototype that will go on the auction block next week was designed in 1989, a year of upheaval for the design wing at Apple. Beginning in 1983, Apple's design language had been defined by one man: Hartmut Esslinger, the author of the Snow White design language that gave Apple its distinctive aesthetic. At the time, Esslinger was contracting out his services to Apple under the auspices of frog design—and thanks to a close working relationship with Steve Jobs, his language became world famous. But by 1987, Jobs had left Apple, and according again to Ed Tracy, Esslinger was on his way out, too. He broke his contract with Apple the same year, and followed Jobs to NeXT Computer. Meanwhile, at Apple, Tracy describes several years of "fallen emphasis" on design, and explains that "as Apple's products became less differentiated, their perceived value lowered. In late 1989, it first became clear that they would not prosper long selling almost exclusively expensive computers with nearly unchanging physical designs." Enter the vertical exploration. 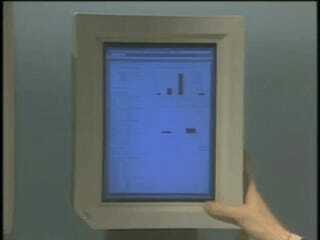 From the looks of it, this particular model was intended to integrate the Radius' vertical display into Apple's actual body; as Schulz told me, it was a study for Apple's LC, or Low Cost, family of computers. Over the next few years, as Apple reaffirmed its commitment to design as well as its emphasis on affordability, the vertical monitor passed into oblivion, though the idea of pivoting a single screen did survive and flourish as the years wore on. It's fascinating to imagine a world in which the vertical monitor, rather than the horizontal one, could have become the norm. And perhaps we haven't seen the last of it just yet. Your smartphone is an essentially portrait-mode device. It's not outside the bounds of imagination that personal computers could readjust to users who are most comfortable when the world is seen in portrait. After all, we've only been viewing the world in landscape mode for a few decades. The printed word—an essentially portrait-mode experience—predates that by centuries. We've got plenty of time to change our minds. If you're interested in picking up where Apple left off, the foam model is expected to go for around $1,200 to 1,800 on June 4.